Challenger offers the pipelayer machine for sale that you need. 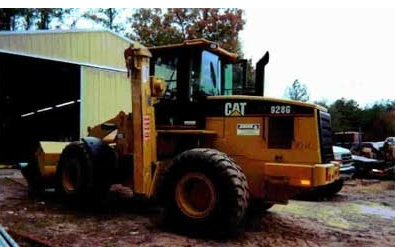 The Challenger Services CP2R pipelayer is available with a Cat® 928G or IT28G tractor. The Caterpillar 928G and IT28G series tractors have rubber tires for on or off-road applications. The bucket up front gives the machine more versatility on the job to handle overburden, fill, sand or gravel. And with the IT28G, which is also equipped with forks, the contractor can now handle pallets, pipe, slings and more. Total versatility in one machine.